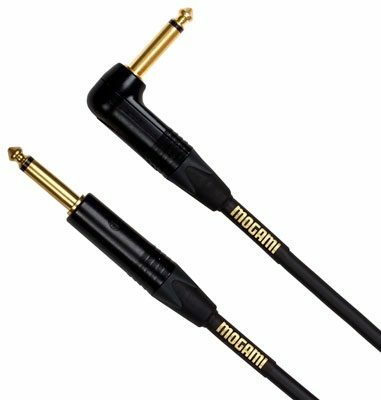 The Gold Series Instrument Cable uses Mogami 2524 High Definition instrument cable. This extremely low-coloration design maintains the unique personality of your guitar or any instrument. Mogami's exclusive hi-density shield eliminates electrical noise, and handling noise is nonexistent since they use carbon impregnated PVC as an additional layer. If you are serious about your music, this cable is for you. High-definition instrument cable. Gold contact/black body Neutrik 1/4-inch plugs. Top engineers rave about its amazing clarity and silent background. If accuracy in reproduction is your goal, this is the cable for you. Overall: This cable is straight up worth it. It was better than livewire, planet waves, and monster rock. Unlike other brands, you will get what you pay for and hear the difference. Yeah sure its expensive, but you have a lifetime warranty. I compared these to my monster rock cables and I will never consider switching back. Likely to be the last cable I ever buy. If someone stole it, I would hate them forever. But I would buy them again and not think twice about the price. This cable is transparent, punchier, more present, and more dynamic than anything else I've tried. Took me less than 5 minutes to notice and hear the improvement. You will too. If youre unsure about these cables don't be. They're awesome. "Quality - physical product and sound"
Overall: I finally took the plunge and got myself a quality instrument cable for recording, and I'm not looking back. Not only is this cable superiorly made, it also just makes my instruments sound better. It fits perfectly, and doesn't buzz or hum. It's quiet, and clear, and doesn't feel like it's going to fall apart with daily use. This cable is a lifer. Well worth the price.